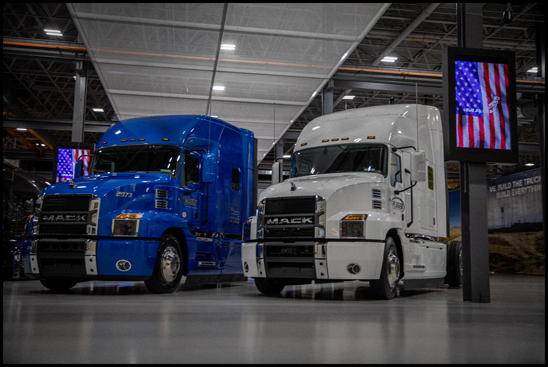 GREENSBORO, NC (April 2, 2019) – For the next year, two customers operating Mack Anthem® models will track their fuel savings efforts and share their experiences. Jamie Hagen, owner of Stratford, South Dakota-based Hell Bent Xpress, LLC, and Joel Morrow, senior driver and vice president for fleet equipment procurement at Ploger Transportation based in Norwalk, Ohio will capture and communicate data using the hashtag #Mackonomics. Throughout the year, both Hagen and Morrow will track their loads, driving distances, routes, weather and more in evaluating how their Mack Anthem models stack up on fuel efficiency. Hagen (Twitter) and Morrow (LinkedIn, Facebook, Twitter) will regularly post updates, videos and other content to show just how much #Mackonomics is saving their operations and improving total cost of ownership. Content from Hagen and Morrow also will be featured on Mack’s social media channels (Facebook, Twitter, Instagram, LinkedIn, YouTube). Morrow and Ploger Transportation, a truckload carrier, are no strangers to chasing fuel efficiency advantages and have a long history of pushing the envelope to find additional savings. Both Mack Anthem models are spec’d with Mack’s HE+ efficiency package, which combines the 13-liter Mack MP8HE engine with Mack Energy Recovery Technology, along with several aerodynamic and efficiency enhancements to deliver up to 9.5 percent improvement in fuel efficiency. Mack Energy Recovery Technology captures energy from the engine’s exhaust that would otherwise be wasted and converts it to mechanical energy fed back to the engine crankshaft as additional torque. This extra energy helps relax the engine and improve fuel efficiency. The Mack HE+ package is available exclusively with the Mack mDRIVE™ automated manual transmission, which is fully integrated with the Mack MP8HE. The Mack mDRIVE constantly monitors speed, grade, load and other variables to identify ideal shift points and help ensure the truck is always in the right gear and delivering maximum efficiency. The mDRIVE also enables a lower, downsped cruise RPM to take advantage of the extra torque provided by Mack Energy Recovery Technology. The Mack HE+ package also includes Mack Predictive Cruise, an intelligent system that allows the mDRIVE to memorize routes when cruise control is active, storing up to 4,500 hills in its memory. On subsequent trips on the same route, Mack Predictive Cruise engages the ideal shift strategy for maximum fuel efficiency.